BOTTOM LINE: This adaptation of Ayn Rand borrows heavily from inspiration such as Rocky Horror to present a bizarrely entertaining if disjointed evening of theatre. This musical retelling of Anthem interprets the struggle of the individual versus society through a mythic eye, naming the characters after Hermes, Pericles, and the like. While in the novella the main character eventually names himself Prometheus (Jason Gotay), in this interpretation that is always his name. His desire to learn is admonished by the First Citizen, Pandora (Jenna Leigh Green), and his chosen biological mate Hera (a completely adorable Remy Zaken). Prometheus discovers a secret tunnel into the wilderness where he meets and falls in love with Athena (Ashley Kate Adams), the Queen of the Forest. Together they lead a rebellion against the state to give everyone the freedom to be individuals. The struggle is definitely just that, as despite the State being characterized as a ‘disco-topian’ society (borrowed from the director’s notes in the playbill), Pandora ultimately wants to help Prometheus and society as a whole improve. Likewise, the individualist Athena lies, seduces, and intimidates to further her own agenda. This multi-layered take on a usually black & white theme is both refreshing and frustrating, but alas left me as an audience member unsure of who to root for. A cartoonish Randy Jones as Second Citizen Tiberius seemed to be the true villain, along with the scorned Hera – perhaps a statement that the desire to move up in the world is the root of evil? Who knows. 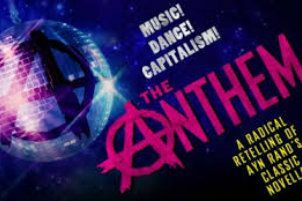 Supporting the theme, The Anthem has a pop-rock opera score by Jonnie Rockwell and Erik Ransom which keeps things peppy throughout (especially Zaken’s "State Sanctioned Love" number) with a few power ballads to allow the singers to strut their stuff. The thrust of the plot is frequently interrupted by dance and stunt transitions, which are all quite lovely to watch even if they may distract from the story. The two and a half hours could have easily been cut into a more digestible ninety minutes if these elements were combined more organically. It will be interesting to see if this production evolves and grows into a larger space in the future as the segments I liked were really quite brilliant despite arriving inconsistently. Rachel Klein’s direction and choreography is definitely a unique voice in the theatre, combining elements of 70s concept musicals with a modern sensibility; it will be worth watching her career.